What happened to Paradise Square? That very auspicious name was given to the neighborhood built in the early 19th century over the site of Collect Pond. A pristine body of water in colonial times, Collect Pond was basically an open sewer by 1800. It was located near today’s Centre and Lafayette Streets. The city filled the pond in 1811, and Paradise Square sprang up over it, according to the New York City Department of Parks and Recreation. But Paradise Square only lasted a few decades. The water table was so high, the neighborhood began sinking—and emitting a rancid smell, prompting affluent families to leave. By the 1830s it was known as Five Points, the notorious slum that was a breeding ground for crime, gangs, and disease. The Paradise name lived on until the early 1900s in the form of Paradise Park, as seen in the NYPL postcard above. It was renamed Columbus Park in 1911. This entry was posted on June 21, 2010 at 5:44 am and is filed under Lower Manhattan, Politics. You can follow any responses to this entry through the RSS 2.0 feed. You can leave a response, or trackback from your own site. I’m a bit confused–wasn’t it Mulberry Bend Park prior to becoming Columbus Park? There never was a “Paradise Park”. 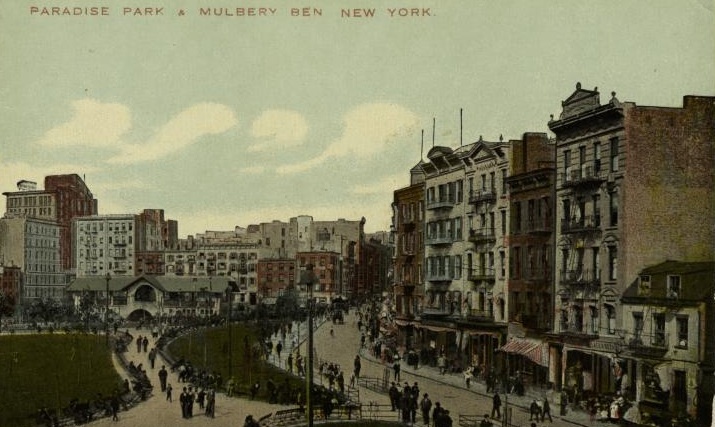 Prodded by Jacob Riis, the city, in 1895, seized private property and demolished the tenements located in what was left of the infamous Mulberry Bend. The park, built on the location and opened in 1897, was named Mulberry Bend Park. It was renamed Columbus Park in 1911. Yes, but all of those are pre-95. I’ll bet it was paradise park pre-95, Mulberry Bend 95-11, and Columbus thereafter. Most of those articles are between 95-11,a lthough one is from 94–interestingly, it is about protesting the condition of the park. Thanks. That’s probably why the postcard included both names, Paradise Park and Mulberry Bend. Reading about Poverty Hollow and bumped into Paradise Park. The latter seemed to be derived from Paradise Square and was considered synonymous. Must have surely been a sarcastic self-infliction, and described a specific plot of public space near, but not within, confines of Mulberry Bend, later Columbus, Park. Much smaller, it was on the other side of Worth and bit up the block towards Centre. It’s mapped pretty clearly, but not named, on old atlases. Without extensive amounts of excavation, managed to find a description using the name and identifying the location written in 1851. I see internet writing that implies that Paradise Square pre-dated descent into Five Points. Very hard to imagine that it was some sort of high-toned, earnest moniker. Contemporary accounts and others long in print suggest the district was a foul, unwholesome situation before the warrens of miserable houses went up to shelter the powerless. Paradise Square/Park was the focus of serious missionary effort by Methodist Episcopal outfit commencing around 1849. Interesting to note that Methodist “revivalist” outdoor preaching had been done for generations in Sheffield (England) in – you guessed it – Paradise Square. The name spread beyond the confines of the Square (really a Triangle) and like a lot of other squares in town, gave its name to the surrounding district. Tammany types – like their pals in Poverty Hollow – used Paradise Park to describe a neighborhood, not merely a small, fenced-in park. I’m inclined to think that Paradise Park superseded Five Points in speech at an earlier date than in print, and we may be indulging a bit of imaginary conjecture to reverse the sequence. 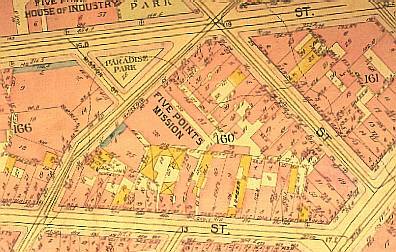 The park on the Bend was named after “Mulberry Bend”, and “Five Points” before becoming Columbus Park. Another place the confusion could have arisen is that Riis *did* call it “ANOTHER Paradise Park” when planning it. That was for comparison only; it was never actually called that. (See also Anbinder, “Five Points” p.22; on Google Books). Manhattan’s Collect Pond and London’s River Fleet: both large, fine supplies of fresh water which were sadly allowed to become open sewers, before disappearing in the 1800s.